How do you get people to eat your products during Ramadan - a month of fasting? This case study looks at how Almarai a large dairy company in the Middle East launched a health and wellness social media campaign to support and inspire those fasting and most importantly keep the brand front of mind. How do you integrate a bold brand like Sprite into a heavily censored region such as Saudi Arabia? This case study looks at how the drinks brand used a YouTube comedy series tied with digital and on pack promotion to win over the youth audience and get round content filtering, boosting sales 15% in the process. In a bid to grow its market share across the Gulf region, Nivea encouraged Arab women to express themselves through writing and bring it to life through short films. This case study looks at how the beauty brand combined social and video content to help sales of its new body lotion steal 12% market share from its largest rival in just a year. How do you make financial services appeal to the younger generation? This case study looks at how Emirates NBD used mobile app Shake N’Save combined with social media and video content to encourage savings among teens and potentially win over their custom for life. This Girl Can is a nationwide campaign by Sport England to inspire women and girls to get moving, get active and exercise. There is a huge gap between the amount of men and women doing sport because millions of women and girls are afraid to exercise of fear of judgement. The campaign has a strong empowering message to feel comfortable working out regardless of shape, size or age whilst celebrating women in sport. Ireland’s first game of the 2015 Six nations tournament took place in Rome last weekend, with huge expectations on the team for the opening game against Italy, the Irish Rugby Football Union (IRFU)’s social media campaign helped to create a community feel for all the fans making the trip to the Italian capital and those watching from the Emerald Isle. In 2008, Walkers crisps renewed customers interest in new flavours by revamping its traditional brand development process and getting consumers deeply involved in product development. The campaign was a huge success with over 1 million flavour suggestions, 4.3 million visits to the walkers.co.uk site (with four to nine minutes spent on site) and saw year on year sales growth increase by 68%. Building on this, Walkers decided to re-launch the campaign in 2014 with the eventual winner, winning a £1 million cash prize. 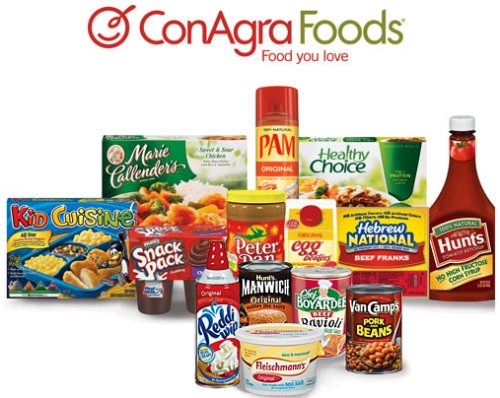 ConAgra Foods worked with advertising partners and measurement firm comScore to transform its approach to online advertising, resulting in improved campaign performance and ROI. This case study looks at how the FMCG giant achieved a 70% lift in attribute awareness and 30% lift in purchase intent by fine-tuning its targeting and working closer with publishers. Straight from out of left field, Loctite's first-ever Super Bowl ad succeeded in getting people to talk about the brand. The 52-year old glue brand spent its entire annual budget on one Super Bowl commercial- priced at $4.5m for a 30 second slot. This case study looks at whether the gamble paid off. With the demise of many once popular high street brands it has never been more important for retailers to have a multichannel strategy. It is important for business to track their customers using data collected both in store and online. A great example of the value of an email address can be demonstrated by Evans Cycles email marketing strategy. 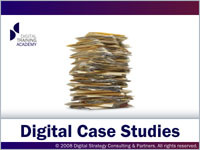 This case study looks at one customer’s journey through the email marketing process. To celebrate ANZ becoming the principle partner for Sydney’s 2014 gay and lesbian Mardi Gras the bank bedazzled ten of its ATMs in the city. The banks ‘GayTM’s’ were such a success that the campaign won seven awards at the Cannes Lions 2014 including the Grand Prix prize for Product Innovation in the outdoor category. 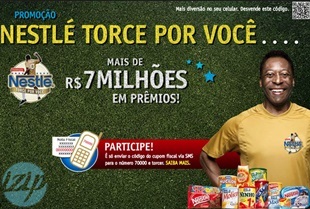 In 2008 Nestlé launched a major SMS campaign in Brazil to promote sales, with football idol Pelé. The campaign: “Nestlé Torce Por Você” which translates to “Nestlé roots for you” saw Pelé wear 27 different teams’ football shirts from the Brasileirão série A and B. Pelé asked people to participate in the campaign with the message ‘to change people’s lives I wear your shirt’. Posters of Pelé in the various football shirts were displayed on billboards, magazines, newspapers and on TV where Brazilians were encouraged to interact with the brand using their mobile phone. In December 2013 Triggered Messaging and cottages4you worked together to introduce a browse and cart abandonment strategy which went live in early January 2014. Cart abandonment is a challenge that faces every organisation selling online, but it is dependent on visitors placing items in their basket. Crucially, it doesn’t’ take in to account the often larger number who simply browse and leave. This case study looks at how “For every £1 invested with Triggered Messaging it has returned £9.57. The unstoppable growth of mobile is changing how people engage in everyday tasks such as shopping, banking, learning, work, entertainment and even health care. In developing countries, mobile money has become a phenomenon, but success has relied on mobile operators and banks acting as collaborators, not competitors. This case study looks at how mobile network Airtel and the Equity Bank of Kenya formed a successful partnership that helped propel mobile money accounts into the mainstream across large parts of Africa. With an improved mobile site in place, the team at George at Asda wanted to drive smartphone traffic and conversions through intelligent use of Google AdWords. This case study looks at how the clothing brand used smart keyword bidding to ensure that mobile outperformed desktop for search conversions for the first time in the account’s history. Billboard magazine in Brazil challenged its advertising agency Ogilvy to help their magazine stand out on shelves in newsagents. The result: the first music magazine in the world to play the music readers are reading about. Sports and fitness are often very social activities, and UK sports brand for women Sweaty Betty capitalised on this to offer a drastically different shopping experience for consumers compared to the ‘warehouse’ feel from the likes of Sports Direct. So what makes Sweaty Betty stand out in the overcrowded fitness market? This case study looks at how the brand built a social community around fitness challenges to boost brand loyalty. Drawing on the success of its custom shoes site NIKEiD, Nike teamed with Instagram to create NIKEPHOTOiD. Instagram is emerging as a key social platform for driving audience behaviours and with this knowledge Nike launched one of the most successful campaigns on the social network to date. Smartphone users in Australia were given a rude awakening on 13th January 2015, when a technical glitch meant the customers of mobile network Optus were woken up an hour earlier by their alarm apps. This case study looks at how the brand reacted to the social media backlash with offers of free coffee and food. With mobile games proving big business, what exactly does it take to make it to some of the best game lists of the year? Ustwo, the developer behind indie smash hit Monument Valley, has provided a rare insight into the production costs, pricing strategies and sales breakdowns that helped the award winning puzzler become one of 2014’s success stories. In January 2015, Weetabix launched a £5.5m multi-channel push featuring 'Weetabuddies' characters to encourage more families and kids to the breakfast cereal brand. This case study looks at how the food brand created a fun interactive campaign that got parents onside while encouraging kids to play with their food (in a good way).